Well, after all of the hard work to get through the competition rounds, it was time for the national final! Out of the three teams that our school had entered, we’d managed to get two into it. Up against them were eight other teams from schools around the country. This was going to be a hard competition round however you looked at it. The competition was due to start at 10AM, with registration opening from 9AM. We’d left our school at 6:30AM (a surprise for all of us that every student turned up on time!) to make sure that we’d get to the IET in London on time. Eighteen miles from the place we’d got stuck in the London rush hour traffic. It was 8:30AM. 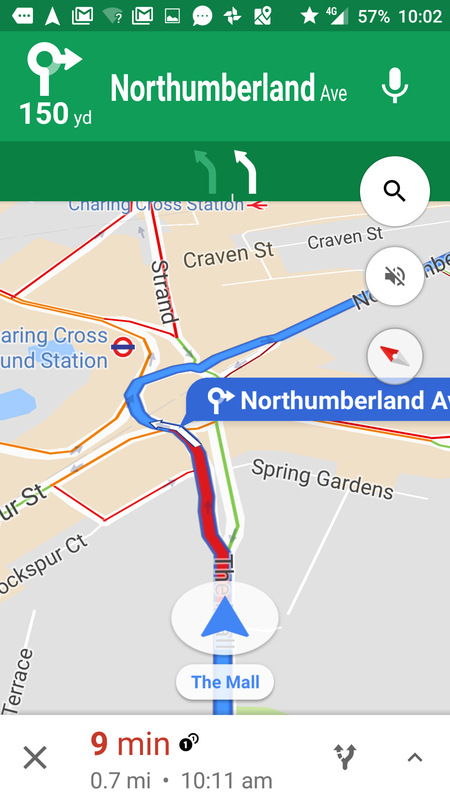 Google Maps was showing a delay of one and a half hours. The teacher in charge called up the people running the competition to let them know what was going on and they we were going to be late. Very helpfully, they said they’d delay the start of the competition for us to get there, and to get there as soon as we could. Around 20 past ten we arrived at the place and were escorted to the cloakroom where our coats and bags were dropped off, and straight into the waiting area with all of the other competitors. They did all look at us as we came in, but we just keep walking and played nonchalant, so I don’t think they noticed. After a few minutes milling around in that room everyone was invited into a large room in the building, which was a large two-floor library. There was a stage in the middle of the room with the ten tables dotted around the edge of the room. After the introductory speeches were finished, everyone who wasn’t a competitor was asked to leave the room to let the students be told what was needed to be done to start the competition. One of the main differences between the competition rounds and the final is that no-one is given a team number, rather on the scoreboard everyone is listed with a team number of “Team”. This meant that it was difficult to work out which team was in the lead, but it helped to add to the excitement watching the teams jostle for the top spots. 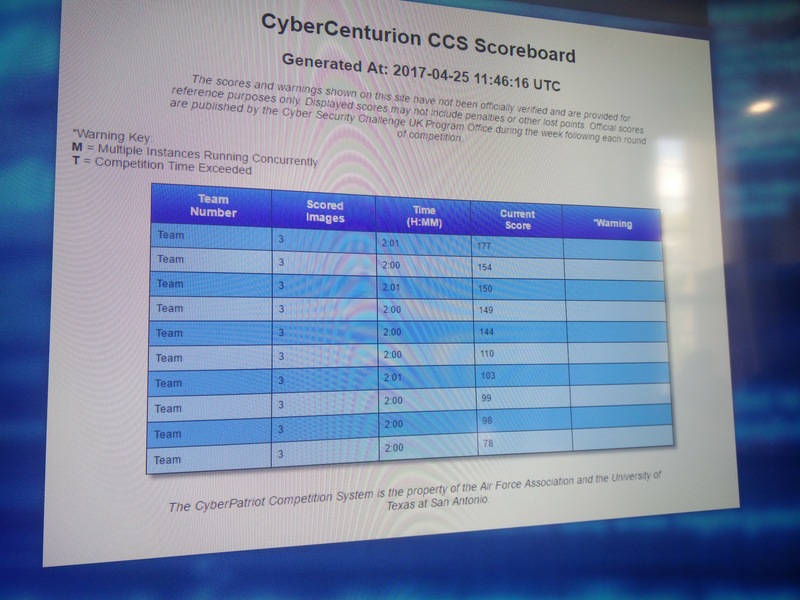 After an hour into the competition, there was a very large gap between the top (130 points) and bottom (49 points) teams. 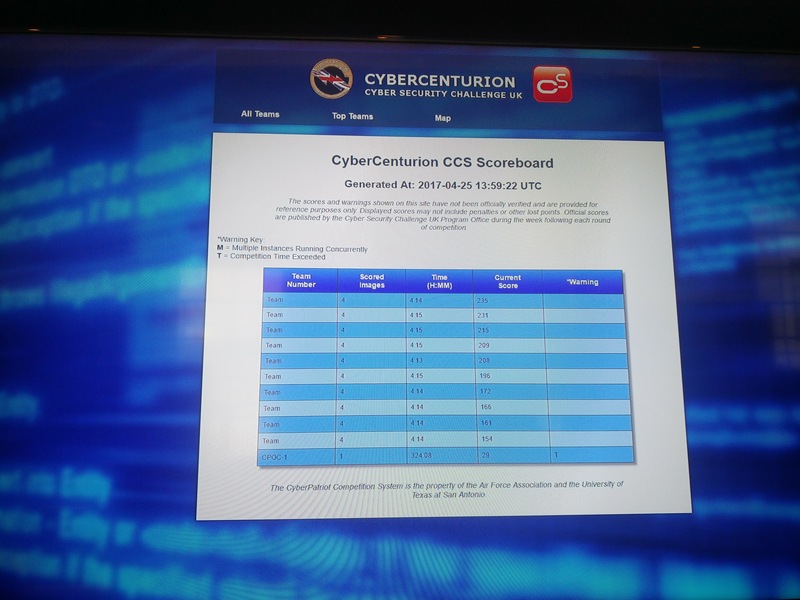 There were three images for the competitors to work on: Ubuntu 14, Windows 7 and Windows 10, the latter of these was the first time it’s appeared in the CyberCenturion competition. One of the things that was different to the final round last year was that we were allowed to walk around the competition room (using out “library voices” should we need to talk to other team leaders). This gave a unique opportunity to see how other teams worked compared to our two. Also in the competition room was “the worlds most advanced bomb disposal robot”, which put on a few displays when the competitors weren’t competing. The two hour mark meant that it was lunchtime. With no team numbers on the scoreboard it made it difficult to know which team was in the lead. 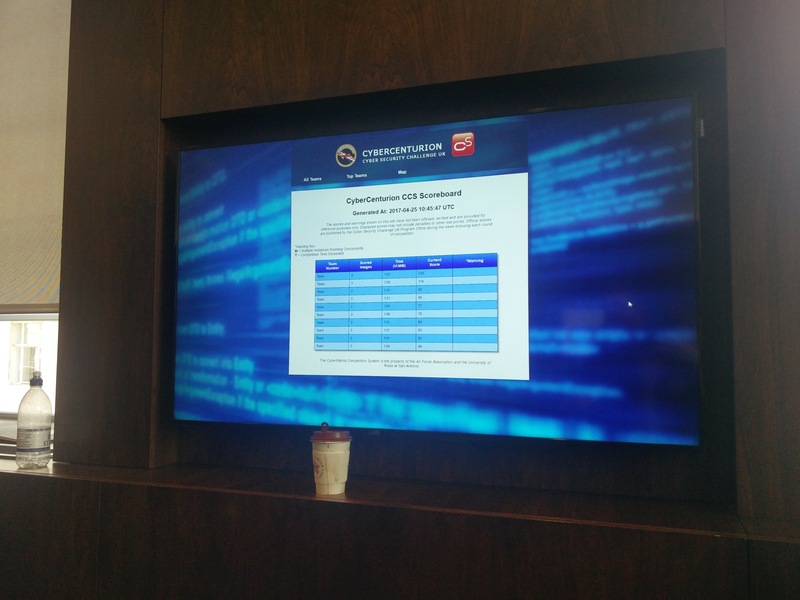 Our teams added up their scores showing on the scoring reports on the images they were running before they had to stop, so they knew approximately where they were. One team were in last position (they thought) and the stronger of our teams were in second or third place, so they were in a good position at that time. During the lunch break it was possible to speak to the competitors to see how they were finding it. They all agreed that it was the toughest round yet, as there were around 40 issues with each image. 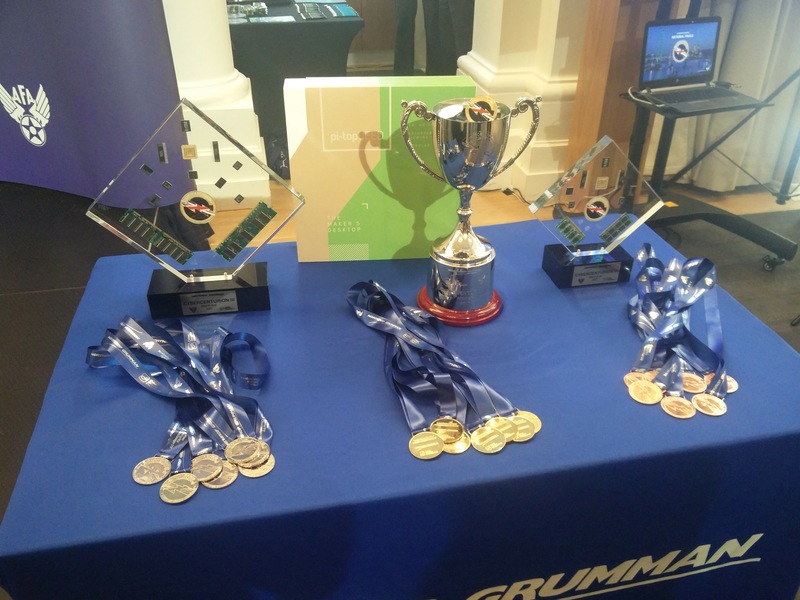 I also had a chance to see the finalist trophies up close, and I personally (as well as some of our competitors) preferred the second place trophy more than the first place one. 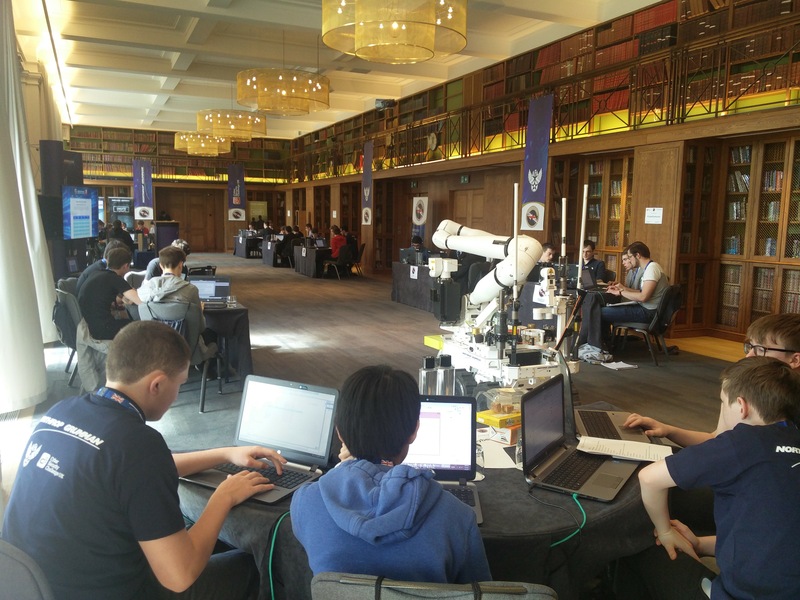 In the second half a fourth image was introduced to the competition, which meant that each competitor was working on a virtual machine each. Throughout this half the top of the leaderboard jumped around a lot, with most of the teams only one point apart from each other for a while. Near the end of this half I had another look at how out teams were doing, and while they were still scoring points they were making the occasionally silly mistake meaning they lost out on some points. Finally the full four hours of competition round had finished and it was time for the scores to be checked and the winning teams announced.